Are you a Candidate for Dental Crown Treatment? 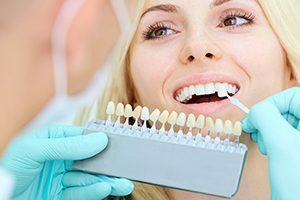 Dental crown treatment is a procedure that covers an ailing tooth with a full coverage porcelain restoration – literally crowning it to improve the tooth’s size, shape, condition and/or appearance. A dental crown treatment is an aesthetic and restorative procedure done to provide stability to the tooth. A chipped or fractured tooth, causing pain when chewing. A dental crown can provide stability and help to evenly distribute the stress of chewing, which often eliminates the pain entirely. Sometimes it’s best to leave a temporary crown on for a while to ensure that the tooth doesn’t require a root canal instead. Post-root canal therapy. After a root canal procedure, the tooth that remains is often prone to fracturing. It often needs to be replaced with a new porcelain dental crown in order to prevent it from breaking. A large filling that consumes at least half the width of a tooth. A filling of this size can leave the remaining tooth in a compromised position, which can cause it to fracture. A dental crown can help to strengthen the effected tooth. Tooth decay. Untreated tooth decay can spread causing infection, pain and the loss of a tooth, but a dental crown can minimize all three unwanted consequences. Tooth wear or malocclusion. Tooth injury or nightly teeth grinding can cause a tooth to become shorter or lose its shape over time. Oftentimes the enamel will completely wear away. A dental crown can do more than look like “the real thing”; it can also feel and function like a real tooth too. Tooth discoloration or another cosmetic imperfection. A dental crown can make an unpleasant color or space look natural and worthy of smiling again. Dental crowns are made out of gold, porcelain and zirconia. The procedure typically requires 2 appointments to a dentist to complete the treatment – the first to prepare the tooth for the crown and the second to secure the permanent crown. Currently and until November 23, 2017, Desert Breeze Dental is offering a $100 discount off the price of a dental crown treatment, making it even more affordable. A consultation, including x-rays or past treatment diagnosis with our Desert Breeze Dental doctors is required. The discount cannot be combined with any other promotion. Call us at 702-869-0032 to schedule your dental crown treatment. October is National Dental Hygiene Month, and proper dental exams are vital in order to avoid a number of oral conditions such as gum disease and oral cancer. Dr. Paul VreNon and his staff at Desert Breeze Dental would like to share some tips about proper oral hygiene and what can be done to help raise awareness about good oral health. Brush your mouth, not just your teeth: Your teeth aren’t the only things in your mouth that need attention, don’t forget to take care of your gums, tongue, and the roof of the mouth too. Brush twice a day, preferably in the morning and evening. When brushing, brush at a 45-degree angle so that the bristles of the toothbrush are angled near the gum line and be sure to focus on the inner surfaces as well. Don’t forget to brush the tongue and roof of the mouth too (gently) in order to get rid of bacteria that can cause bad breath. Floss those pearly whites regularly: Brushing your teeth daily only takes care of the surface. It’s important to get into the habit of flossing daily in order to ensure that food residue and other substances are removed to prevent decay and periodontal disease. Maintain a teeth-friendly diet: Diet can have a significant effect on dental hygiene. Foods such as nuts, fruits (such as apples), cheese, chicken and veggies are teeth-friendly. Tobacco use should be avoided, and alcohol and soda intake should be limited. Heavy alcohol and soda intake can deplete enamel surfaces and cause dental hygiene issues such as decay. Visit your dentist: Make it a habit of visiting your dentist twice a year. In order to stay on top of your oral hygiene, make sure to schedule an oral exam and a regular teeth cleaning.